NTT DoCoMo Inc. Xperia smartphones by Sony Ericsson Mobile Communications AB are displayed at CEATEC JAPAN 2011 at Makuhari Messe in Chiba City, Japan, on 4 October.Bloomberg. Helsinki/Tokyo: Sony Corp is in talks to buy out Ericsson’s stake in their mobile phone joint venture, a source said, in a bid to catch up with rivals. The move could help Sony recoup ground in the battle against Apple Inc and Samsung Electronics , where it has been hampered by its disparate offerings of mobile gadgets and online content. Yoshiharu Izumi, an analyst at J.P. Morgan in Tokyo, said the deal could be worth upwards of $1.3 billion, depending on what agreement the two reach about the continuing use of Ericsson’s telecoms patents. “Up to now Sony’s products and network services have all been separate. Unifying them would be positive," Izumi said. “If they can leverage their games and other network services I think they can lift their share," he added. Ericsson and Sony declined to comment on the talks. “We have a long-term commitment to our joint ventures," said an Ericsson spokesman. “The talks are not something that have been announced by Sony. We are declining to comment," said Mami Imada, a Sony spokeswoman in Tokyo. Sony’s shareholders, however, appeared wary of any deal that would burden the company’s finances. Its stock was down 3.3% at ¥1,422 on Friday afternoon, compared with a 1.4% gain in the benchmark Nikkei 225 index . “It’s not necessarily bad news, but the share is falling, so investors apparently see some minuses, such as concerns about how Sony would finance the purchase, as well as the difficulty of valuing Ericsson’s patents," said Koichi Ogawa, chief portfolio manager at Daiwa SB Investments, which owns Sony shares. The joint venture, formed in 2001, thrived after its breakthroughs with Walkman music phones and Cybershot cameraphones, both of which leveraged Sony’s brands. But it lost out to bigger rivals Nokia and Samsung at the cheaper end of the market, and was late to react to Apple’s entry into the high-end of the market. It has refocused its business to make smartphones using Google’s Android platform, but has dropped to No. 9 in global cellphone rankings from No. 4 just a few years ago. The joint venture is making some progress and turned in a net profit of €90 million last year after booking a loss of €836 million in 2009. But it reported another loss for the April-June quarter. The venture is due to report its September quarter results on 14 October. “A buyout would make a lot of sense for Ericsson as I believe their share in the joint venture is worth to them between zero and minus 1 billion euros," said Sanford Bernstein analyst Pierre Ferragu. “Whatever price they agree on, it would be a positive for Ericsson." Shares in Sweden’s Ericsson gained on the report and closed 6 percent higher at 69.20 crowns on Thursday. 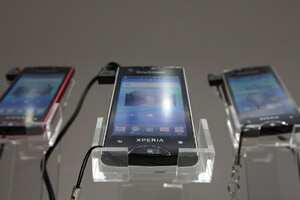 In September at the IFA trade fair in Berlin, Sony Ericsson’s phones were presented inside the Sony hall, mixed with Sony’s TV sets and new tablets.